Despite the multiple political and economic crisis that recently took the Gulf Cooperation Council (GCC) region by the storm, especially the oil prices crisis, the Kingdom of Bahrain – A.K.A the gulf’s pearl – could successfully relatively maintain its economic balance since it was one of the earliest countries of the region to focus on developing its non-petroleum economic sectors and industries; as a matter of fact, the island kingdom and its capital, Manama, is now renowned as one of the major financial and business hubs in the world. Such a major role is best reflected through the investment projects that are currently being developed by local and international companies within Bahrain. 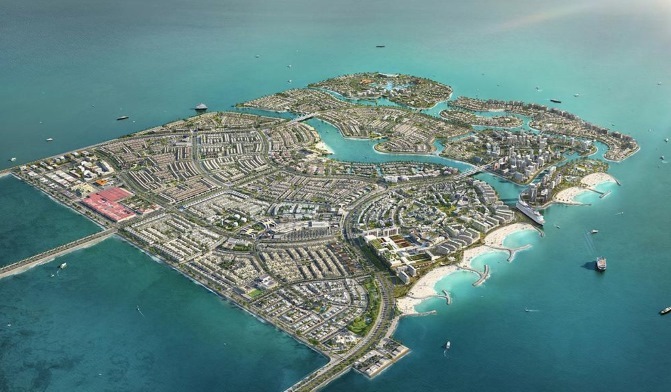 One of these major master development projects is Diyar Al Muharraq, a group of 7 man-made islands located 10 kilometers off the northern coast of Manama which spans a total of 12 square kilometers of land. The islands are developed and managed by the eponymous Diyar Al Muharraq company. One of the most anticipated currently under developments projects with a value that exceeds the BHD78m mark, Al Bareh is a seafront luxurious residential projects situated in the western part of Diyar Al Muharraq island. The project mainly comprises three main sections: the first one includes the seafront residential land plots upon which luxurious villas are currently being built; the second section which includes the land plots located within the heart of the project itself near the water parks; the third and the final section contains the land plots that overlook the main road which will be used to build low-rise buildings on. In addition to all the above, the project houses green areas and several gardens that contribute to its mesmerizing landscape and value to make it a top touristic attraction both regionally and internationally. Due to all these features, Al Bareh is one of the most awaited projects in the GCC region; it will comprise a total of 55 residential villas of moderate and large spaces. It is worth mentioning that the infrastructural works of the projects have already begun in October 2017 and they are expected to take one year to end by the year 2018. With the value of BHD216m, Muarraqiya Market is an under-development vast local market place that whose design and architecture were inspired by the Mubarikya Market in Kuwait which houses stores that sell all the basic good and services. A residential project that is situated within one of the freehold areas of the Kingdom of Bahrain (areas where the foreigners are allowed to own and purchase properties) , Al Naseem’s value exceeds the BHD208m mark and it will comprise 1450 residential units including 1200 apartments and 250 luxurious residential villas. To summarize. Diyar Al Muharraq islands were – and still are – one of the most promising and ambitious projects in the kingdom of Bahrain which reflects its vision for the future and economic development. It is easy to predict that the aforementioned projects will have a positive impact on the Bahraini economic growth in general and the investment in Bahrain’s real estate specifically because of the variety of options they offer for buyers and investors that cater to all of their needs. Eventually, this will help support Bahrain’s status as one of the major financial hubs and touristic attractions in the region.